Neo-Mercazole tablets 5mg are used to treat hyperthyroidism or over-active thyroid, which causes thyrotoxicosis due to over production of thyroid hormone. The most common form of hyperthyroidism is Grave’s Disease or goitre, which is thought to be an autoimmune disease where autoantibodies called thyroid stimulating immunoglobulins bind to the receptor for Thyroid Stimulating Hormone (TSH) and cause loss of regulation of thyroid hormone production. Hyperthyroidism can also be caused by inflammation, a tumour or a virus infection. Symptoms of hyperthyroidism are due to increased production of thyroid hormone, which causes increased rate of metabolism. They include nervousness, restlessness, irritability difficulty concentrating, tiredness, rapid heartbeat, heat intolerance, increased perspiration, difficulty sleeping, hand tremors, weight loss, increased appetite, frequent bowel movements, and muscular weakness. Neo-Mercazole tablets 5mg are used to help induce permanent remission from thyrotoxicosis; also to restore normal thyroid function before thyroid surgery to remove whole or part of the thyroid gland; also before and after treatment with radioactive iodine for overactive thyroid. 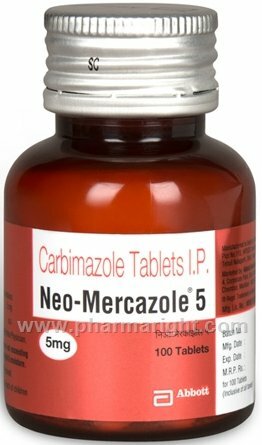 Neo-Mercazole tablets 5mg is not used for a simple non-toxic goitre in which the thyroid may not make enough thyroid hormone but otherwise functions normally. You should store your Neo-Mercazole tablets 5mg below 25°C in a cool dry place.